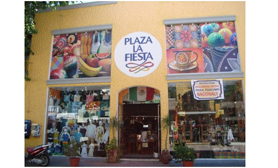 Plaza la Fiesta has 20,000 square feet of showroom space and over 100,000 different items for sale. Probably the widest selection of Mexican goods in the Hotel Zone, it includes leather goods, silver and gold jewelry, handicrafts, souvenirs, and swimwear. There are some good bargains here, so negotiating is encouraged.